Today (30 November) is my day and I am offering a Take a Break gift book filled with a signed book of mine (winner's choice), biscuits, Christmas tea, a tea towel (you can never have too many of these and I do like choosing them) and a mug. Total value £20. I will draw the winner on 8 December 2012. All entrants go forward to the grand prize drawing. 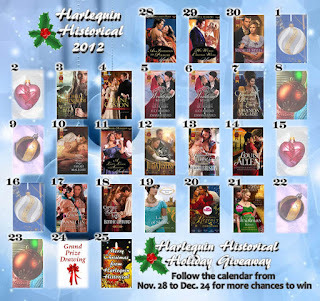 The Harlequin Historical Holiday Giveaway is back! In the spirit of an Advent calendar, we are giving away daily prizes and a Grand Prize of a Kindle Fire (or equivalent tablet depending on your location). Play every day for more chances to win. Each participating author will have an activity planned on their website for their special day. At the end of the month on December 24, one grand prize winner of the Kindle Fire will be randomly selected from all the days' entrants. The more days you visit, the better your chances! Happy Holidays and we look forward to seeing you. Click here for official rules and eligibility. Since starting Tracy Anderson Metamorphisis Omni at the end of September 2011, I have officically dripped with sweat 360 times, conquered 36 different set of exercerises, particularly the challenging leg lifts (more of which later, mastered 4 different Dance cardio routine (aka Hippo dancing as my children call it). My most hated levels were Meta L2,C1.1 L3, C1.2 L3 and C1.3 L7. I think of all of the hated levels, it was C1.1 L3 which I just wanted done. Could I get the coordination of the lunge? It took until D8. But I did master them all. A few exercises stand out: the headstand in C1.1 L8 (the trick was to make sure your elbow and supporting knee touched and you put your weight on your arms), C1.2 L3 the first balance both hands on a weight annd lift leg off the floor, and C1.2 L3 the crazy plank where you had to be coordinated with a controlled collaspe. I learnt a lot about myself. I leanrt that I can do things that I thought I could never do. My fexibility and balance have improved. I am not sure about my tempo. I now love exercising. it has become a part of my life. I am in far better shape than I have ever been. C1.3 has seen a massive improvement in my bum and thighs. There is something to strengthening the deep gluteal muscles so that your hamstrings naturally lengthen (something from pilates but of relevance here) as they no longer have to act as stabilising muscles. It really is all about balance and getting the correct balance between deep glutes, hip flexors and deep ab muscles so that the mobilising muscles don't have to act as stablising muscles. This is one of the reasons TAM takes time and why she doesn't really go after the inner thigh until mid way through Y2. Don't get me wrong -- my thighs are looking good but apparently lots of people have over developed quads etc and it is about effecting real change. I still have loose skin on my lower abs. But I have hope! I have started the Dance Cardio 2.1 with her master trainers Stacey and Maria. They are taller than Tracy. I am beginning to get the hang of it. Having my own playlist helps. I have previewed Y2 L1 for tomorrow. The chair comes into play. As do ankle weights. it is supposed to be a step up. I foresee a lot more sweating in my future. 2. As some of you may already know -- last Thursday we put our very elderly Lab to sleep. His race was run. the legs which had carried him on so many runs and walks had worn out. I will write something about him. I have been meaning to but keep tearing up. Most of the time though I am fine. The collies and the cat are adjusting. 3. Still waitng to hear if my editor likes my revisions but I am keeping busy (see above). 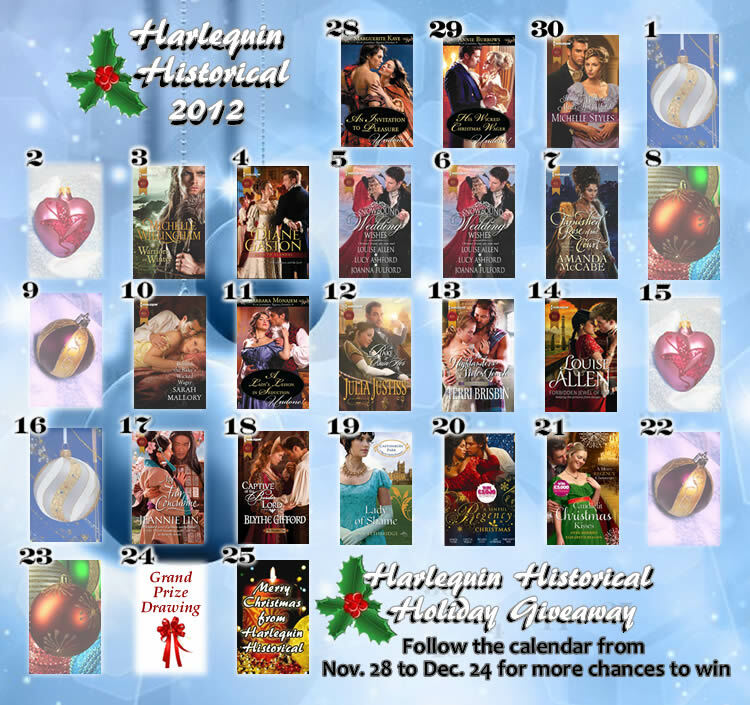 4. the Harlequin Historical Authors will be doing our annual Advent Calendar this year...watch this space. Katherine Garbera who writes Desire and is another American living in the UK (actually she lives in the same town as my in laws!) ask me to do this meme. You can read her answers from last week here. And her books are wonderful as well. Well worth a read. What is the title of your next book? Where did the idea for the book come from? The idea for the first scene popped into my brain several years ago when I was trying to write a single title. Then I used it when I was crafting To Marry A Matchmaker as back story but last year my heroine, Sophie Ravel sat me down and said I had to write her story and that she knew I really wanted to. 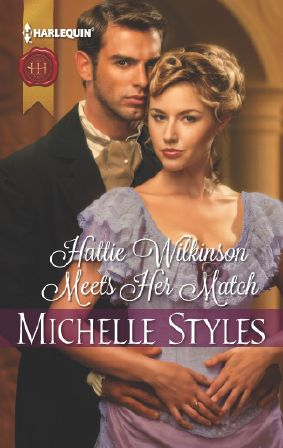 Warm, witty and intimate historical romance. It is set in the 1850s so it is an early Victorian. Some places it will get marketed as a Regency. It is very odd to me but Rengency in publishing is a very flexible term. What actors would you choose to play the part of your characters in a movie rendition? A Keanu Reeves type from around his Point Break days for Richard and a Sally Pressman type for Sophie. These books are traditionally published by Harlequin/Mills & Boon. How long did it take you to write the first draft of the manuscript? I started about mid January 2012, and then had to change quite a lot after my editor had seen the first three chapters. I was explaining to a dear friend about the problem and she said the hero can’t be like that. Then suddenly everything was clear and I wrote the story (all 72 k) as I had to almost start from scratch in 3 weeks. It was great fun to write once I had everything clear. Julia Quinn, Lisa Kleypass and Georgette Heyer are all writers whose style I admire. I wanted to write a warm, witty and intimate romance which had a lot of accurate historical detail. My daughter in addition to the Sophie character demanded I write Sophie’s story as she wanted to know what happened to her after To Marry A Matchmaker. What else about your book might pique the reader's interest? It is a pretend engagement which develops into something more story. And there is a nod to PG Wodehouse with pigs. I adore PG Wodehouse. I was going to tag various authors but they appear to have done this so if anyone wants to take up the baton, please do so and tell me where it is posted. Today is the anniversary of the ending of World War I. It is a day to remember the fallen and injured from all the wars and know that they died to keep us safe and allowed our way of life to happen. It is a day to thank the living who served and continue to serve, risking their lives so we can enjoy ours. I wear my red poppy with pride because it does help to highlight the marvellous work the British Legion does with service families. It also shows that I do understand the sacrifice and am grateful for the sacrifices made. Last night I watched the Festival of Remembrance on BBC 1. It does bring a lump to my throat. (There wasn't anything like it in the US when I was growing up) Anyway, one of the higlights for me is the Chelsea Pensioners. When I first watched it as a bride, there was a man who had served in the Boer War. Slowly the active memories of various wars fade as one by one people die, but it doesn't mean people should forget. So hopefully people will take a moment today to remember and to be grateful. My excuse is that my mother came over from the States and we did a whirlwind tour of the universites where my elder two are studying. And my revisions for The Return of The Viking Warrior hit. My mother went back home last week but I wanted to get the revisions done as I have a New Editor. I found my New Editor''s thoughts really useful and hope she loves my manuscript now. I think it is far stronger but it is always a worrying time when you change editors. You never know quite how they will react or if you interpreted their thoughts correctly. On the plus, sometimes you get overly comfortable with your editor and know where her quirks and hot spots are and this can mean that you are not pushed. I couldn't do anything about the change and so am rolling with it. My new editor loves Vikings so this is good. She also knows how to pronouce the names correctly. I did draw the name out of the hat from my newsletter and Tracy had her package sent off to her. I am still doing my Tracy Anderson Method and have nearly finished the first year of my transformation (ie 360 workouts). And then comes Year 2 with the Chair and lots of challenges for my abs. I will try to be better at keeping up with this blog but work and family have to come first.